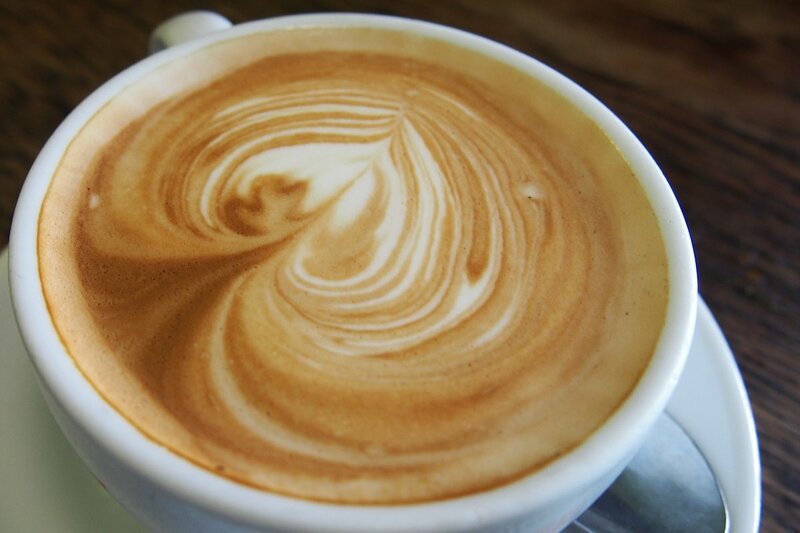 I last reviewed Café Giulia in 2010 but I have been back numerous times since then. It has consistently been one of my recommendations for those looking for a breakfast joint close to the city and I always recommend it to friends with out of town guests. The reason for this is that the menu and seating covers all varieties so there is something to please everyone. They operate on Saturdays only while Bar Mattino across the road is open on Sundays. 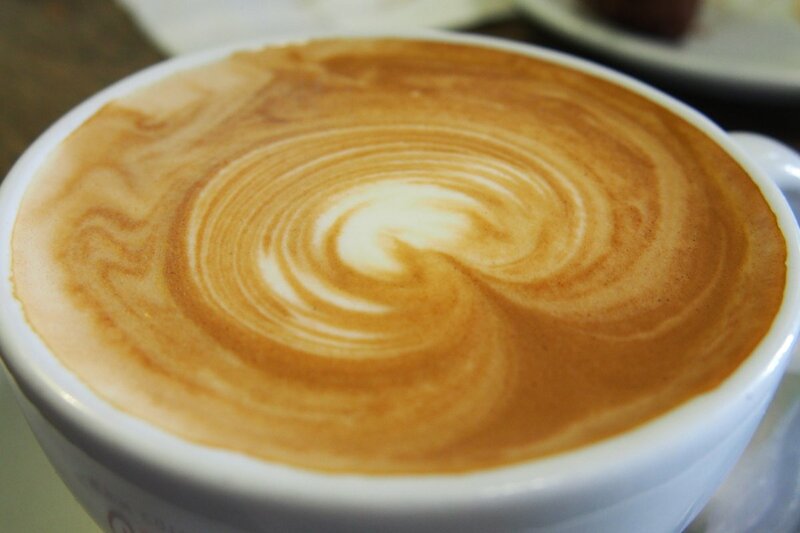 The coffees ($4) come thick and fast in order to keep up with the large number of tables and take away orders but the quality definitely isn’t lacking. Those who prefer any other beverage be it hot or cold will not be disappointed, the menu is huge and contains too much for me to detail here! I did try a smoothie though. The smoothies ($5.90) available are banana & strawberry, banana & raspberry or banana & honey which is what I tried. 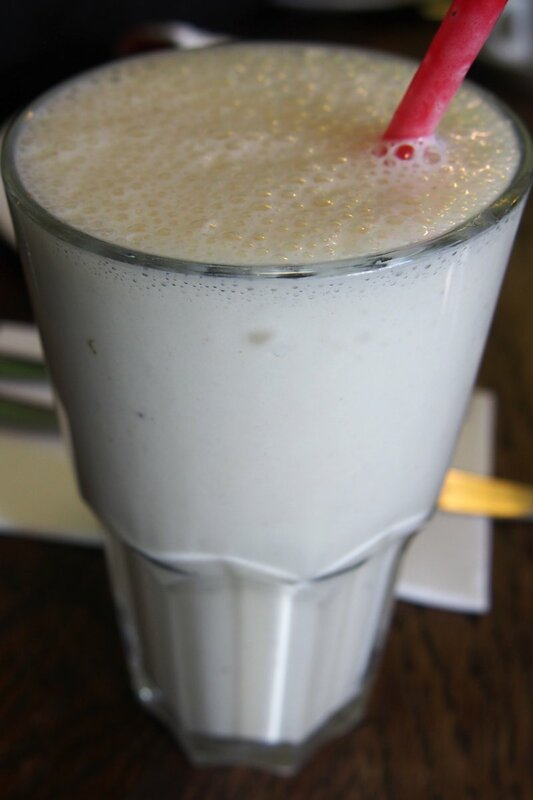 I’ll stick to the banana & strawberry next time as it is vastly better. They have the consistency right, but I wanted more of a flavour explosion. 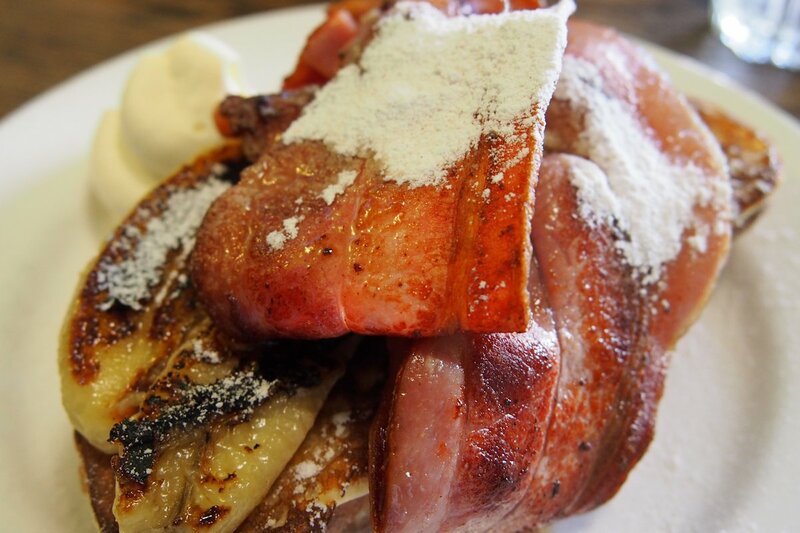 The French toast ($14.90 or $18 with bacon) is one of many dishes available for hungry people! They’re not shy with the servings here so we received lashings of bacon, a halved grilled banana and thick yet soft slices of French toast. The caramelisation on the banana was delicious and you’ll receive enough maple syrup in a bottle on the side to sink a ship. There’s marscapone on the side there somewhere too but I preferred it without. Okay so Giulia has brekky muffins ($5.90) and brekky rolls ($8.90). The price is cheap but they’re both large and filling. Muffins are available with bacon & egg, sausage & egg, haloumi, tomato & egg, smoked salmon & egg, bacon, tomato & spinach or spinach & egg. Got that? Good. Because the rolls (which come with cheese) are available with bacon & egg, sausage & egg, tomato & egg or salmon & scrambled egg. 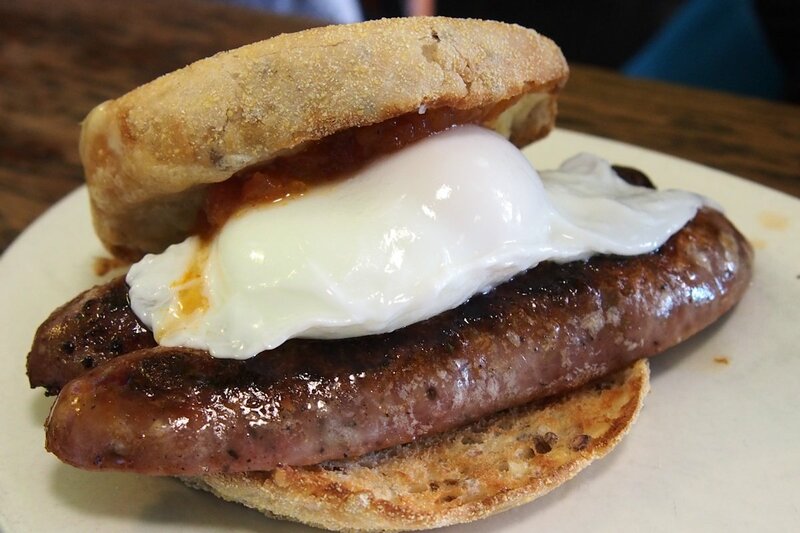 The sausage & egg muffin came with a poached egg and some tasty sausages. The tomato relish (50c) was a sweet and recommended addition. 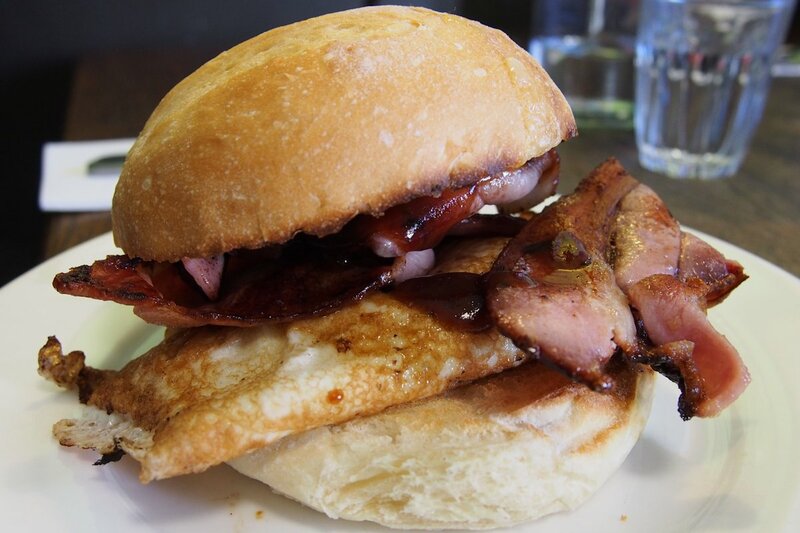 The bacon & egg brekky roll was a slightly more difficult to handle affair although I commend my guest for going in with both hands and coming out the other side with a barbecue-saucy grin! The chipotle slider ($7.90) had arrows pointing towards it on the menu proclaiming that I should “eat this”. So I did. 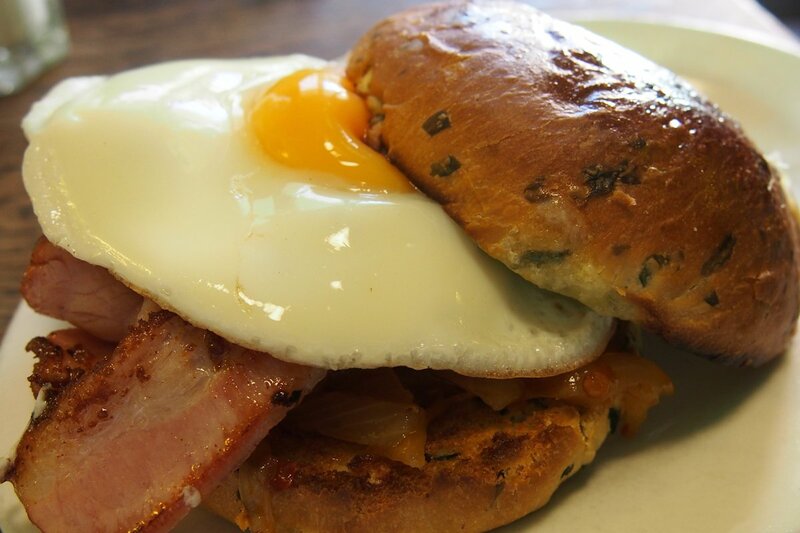 This is a roll with bacon, egg and smokey chipotle onion relish beneath. I think that it was slightly too large to be considered a slider and would have preferred a crunchier roll as overall this was a very soft affair. Some crunch or texture was needed. The onion relish definitely packs a punch so only go for this if you can handle your chilli! Holy moly! 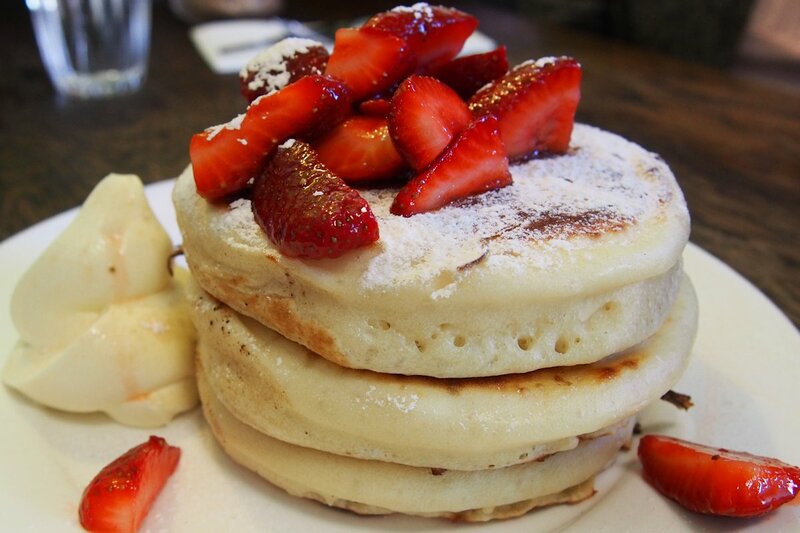 Make way for the pancakes! Available with maple syrup & marscapone ($12.90), lemon & sugar ($12.90) or fresh strawberries & marscapone as we ordered, the pancakes themselves are definitely much thicker than any my guests or I have had before. We would have preferred them slimmer but they were indulgently delicious. Another sweet dish that I need to try next time is the Belgian waffles with rhubarb, brown sugar, yoghurt, marscapone & maple syrup ($16.90). The American diner style of breakfast is alive and well at Giulia so if you like your breakfast big, tasty and very well priced, you should definitely drop in (early as the crowd does well). 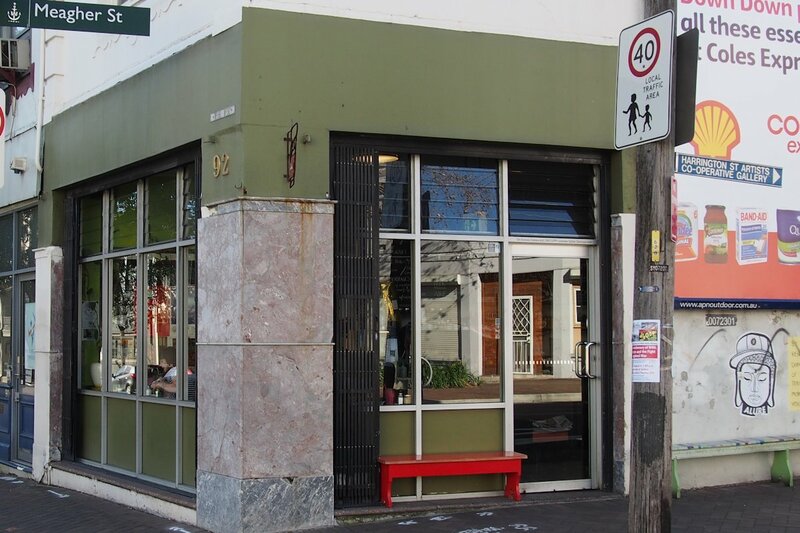 This entry was posted in Sydney - CBD and tagged Outdoor seating, Reasonable prices. Bookmark the permalink.